Discovered in a fortuitous book buying binge from eBay, I finally got around to putting my mystery lot of Christian books away (read, in stacks climbing along the wall.) I usually tend toward C.S. Lewis when in the need for spiritual growth, but of late I’ve felt that this has kept me from exploring multiple different viewpoints and voices, not to mention concentration on timely concerns. Turning to eBay, I bought a mystery box of 100 Christian books, thinking that this would be a good way to discover new, uplifting texts and familiarize myself with key authors in the Christian community. 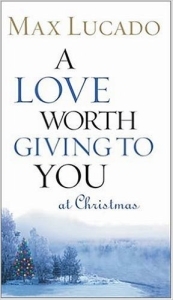 Based on Max Lucado’s best-selling book, A Love Worth Giving to You, this forty-eight page booklet focuses on the idea of receiving Christ’s love in order to give the gift of love to others. I wasn’t familiar with Lucado’s previous book when picking up A Love Worth Giving to You at Christmas; instead, I was attracted by the brevity and the seasonality of the piece. Divided into three section, the booklet is an easy one-sitting read. The sections are: The Season of Giving, A Love Worth Giving, and A Love Worth Giving to You. The first section addresses the spirit of Christmas: why do we want to give and why do we want to give so extravagantly? Lucado examines the initial gift of salvation, Jesus birth, death, and resurrection, commentating that such adoration pointed towards us gives us in turn a desire (if not the unwavering ability) to give back to some extent, both to God and to others. The second, a main section of the book, A Love Worth Giving, is divided into four portions: The Party, The Problem, the Principle, and the Process. Here, Lucado uses snappy imagery and scenarios to deliver what he calls the 7:47 principle (derived, of course, from Luke 7:47) which denotes that a person who has been forgiven much will, therefore, be apt to love more. The principle of course, can be reversed: a person who has been forgiven little loves little. Then we launch into the scene of Jesus at the party in Capernaum where the illustrious church leader is horrified when a prostitute enters his party to bathe Jesus’ feet with her tears. The message is clear, the meaning powerful, and the narrative discussion highlights this Biblical passage with a clarity many of us have never seen before, giving a fly-on-the-wall perspective while explaining the inner workings and dynamics of the story. The prostitute has done much to be forgiven of and in the eyes of society is certainly a bad seed. Yet, it’s the illustrious church leader who has no mercy and no basic courtesy towards Jesus. The 7:47 principle in play. The following sections build upon how, ultimately, we fail to fully love because of our inherent natures. Yet, Lucado argues, one of the greatest and most frequent reasons we fail to give the gift of love which we value so greatly is because ultimately, we don’t accept it from God. Within this booklet he highlights the great love we have been given, how to accept and incorporate it, and then how this incorporation brings joy on our own behalf and opens our abilities to provide others with that greatest gift of all: love and, ultimately, forgiveness. I didn’t expect to be impressed by a 48 page pamphlet with a cute cover – but I was. The message is clear and simple, yet one we often forget when becoming overwhelmed with the demanding side of the holidays. Lucado’s verve in delivery captivates readers and hammers home what Christmas is really all about and what astounding gift we have all received.